The calf muscle group, named the triceps surae, is a group of muscles located at the back of the lower leg (see image on the right). The triceps surae muscle group is composed of two superficial muscles, i.e. the lateral and medial gastrocnemius muscles, and of one deep muscle, i.e. the soleus. 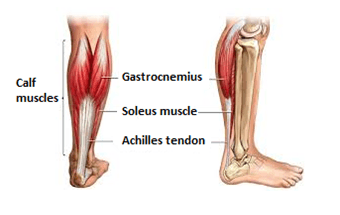 These three muscles insert together at the heel bone and form the Achilles tendon. The principal role of the triceps surae is to allow for plantar flexion of the foot (action of pointing the foot forward) and flexion of the knee (action of bending the knee back). A muscle strain injury at one or more of the muscles of the triceps surae signifies the rupture of a large number of muscle fibers, caused by an excessive contraction of the muscle in a violent or rapid manner. Symptoms of a muscle tear at the triceps surae muscle group include a sudden sharp pain felt at the calf, which is present even at rest. There will also be presence of swelling and bruising and sometimes an audible pop or snap will be heard during the occurrence of the injury. Important weakness in the calf might also occur, and it may be difficult to walk or stand up on the toes.